Learning is considered as one of the potential tool to empower a community. Over the past three decades, technology mediated learning has been recognized as an alternate channel replacing/ supporting/ strengthening the traditional forms of education in various forms, especially with the advent of interactive and collaborative learning. 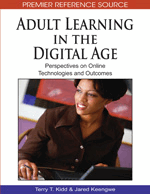 Open and distance learning (ODL) emerges as a potential means of enhancing educational access. On the other hand, open educational resources (OER) emerge as a potential material of this new paradigm of knowledge acquisition process. However, the organizational learning at the peripheries and capacity development at the grass roots remain almost unattended, despite recognized global efforts under many bottom-up empowerment sequences. Social components at large within the transitional and developing economies remain outside the enclosure of universal access to information and thus knowledge to equitably compete with the global knowledge economy. Keeping all these in mind, in a tiny spike, a program has been initiated in a rural corner of Bangladesh to enclave grass roots communities as part of the life long learning processes. The members of the society will be given traditional and non-traditional education, depending on their demands, aspirations and capabilities through a technology mediated educational institution. By clustering them into smaller groups, a micro-credit program will run to empower them economically and socially. Different categories of project (education, health, environment, technology) will run throughout the year for their skill development and knowledge building. Furthermore, adopting appropriate technologies, like introduction of solar power (cooking, water logging, lamps, machineries), wind mills (water logging, electricity) community people will be assisted to carry out their tasks rapidly and easily with limited impact on the local environment and resources. Finally, the surrounding communities will be taken under a Wi-Fi mesh to form a knowledge building network (continued education, self employment, information bank, data mining, improved livelihood, capacity development, market research, food security, basic health promotion, social development, increased governance and sustained advancement) with the intention to propagate knowledge beyond the peripheries. Learning nowadays are not only comprise of traditional brick-and-mortar classroom sessions, but also encompasses advanced computer assisted collaborative learning and peer learning (Roberts, 2004; Tu, 2004) that support education and research. Furthermore, Internet has allowed the learners and education providers to reach out the sky as the limit in designing, understanding and taking knowledge acquisition processes through various learning techniques. In addition, as classrooms do not remain enclosed to confined peripheries anymore, and the learners do not confined to regularly attended students anymore. Anyone, with capability and acceptability can attend a learning session at any time in sequel of his/her career. Despite huge benefits of collaborative learning and being widely known, this learning technique is rarely practices till date. Benefits of collaborative learning facilitates education, research, social cohesion and psychological stability, thus building self-esteem, reducing anxiety, encouraging understanding of diversity, fostering relationships, stimulating critical thinking, increases student retention and encourages group learning (Panitz, 1997; 1998). A country in South Asia with 141.822 million populations living in 147,570 Sq. Km in a deltaic region faces regular natural calamities like, flood, tsunami, draughts, and tidal weaves. This country, Bangladesh has a literacy rate of 51.61 and a lone distance education provider, the Bangladesh Open University (BOU). In spite of potential acceptance, government support and huge demand at the grass roots, BOU could not able to create sufficient scope to facilitate this huge population base. However, there are a few NGOs who are working relentlessly in this sector. BRAC2 is one of them. This NGO (the largest in the World) is providing primary (pedagogy and non-formal3) through over 50,000 village schools and contributing largely to increase the literacy rate. Government has also taken several female student literacy programme4 since 1993 and included special incentive based programme where female students are given free studentship till grade 12. In spite of all these, it is a surprising fact that the drop out rate at primary level remains at around 30%, while it increased to over 50% at secondary level. Hence, there are immense scopes of conducting mass scale literacy programme up to the primary level leading to secondary level, reaching out the grass roots population. Furthermore, with 450,000 Internet users as of August, 20075 (0.3% of the population, according to ITU6) Bangladesh is lagging far behind the World class standard in the technology arena. To uphold the goals of Education For All (EFA)7 and Millennium Development Goals8 a programme was initiated in early 2000 with the assistance of the World Computer Exchange, USAID and UNDP. It was a component of the Sustainable Development Networking Programme (SDNP), a UNDP funded programme through which the project tried to put forward several components. Education and capacity development were among them. The others include, establishment of multi-purpose village information centers, establishment of public use cyber centers (pioneer in Bangladesh), establishment of content based web portal/information bank/data bank for common use, establishment of the longest Wi-Fi based radio link connecting several organizations including the largest Agricultural University, establishment of a national Internet exchange, hosting of the F-root server in Dhaka, and various other innovative projects with novel concepts and ideas. The next section will outline the background detail of the main subject matter of this title and focus a bit on activities of SDNP in several topics that match the theme of the book. In the main thrust section this case study chapter will specifically focus on a few project components. Before conclusion, it describes about the transformation of the UNDP funded project to a civil society action programme and finally it put forwards a few recommendations for carrying out future activities of the SchoolNet Foundation.